It’s safe to say since arriving here in Colombia, I’ve tried my fair share of comida colombiana. However, my interest in food isn’t limited to just the eating part – I absolutely love cooking it too! After trying so many new and delicious things, I felt inspired to start cooking up some Colombian food of my own. But could I, a newcomer to Colombian cuisine, do it any justice? What chance did any arepa or empanada of mine have against that of an abuelita who has spent many years perfecting her secret recipes? Fear not, because help is at hand. Today’s blog post is a special one, as it features a very important guest…les presento a Juanmi. Since I arrived in Barranquilla, I have been living with two very wonderful people. Sara, originally from Canada, has been living in Colombia for the past 13 years. She is married to Juan Miguel (Juanmi), who is from Cartagena, just an hour and a half away from Barranquilla. 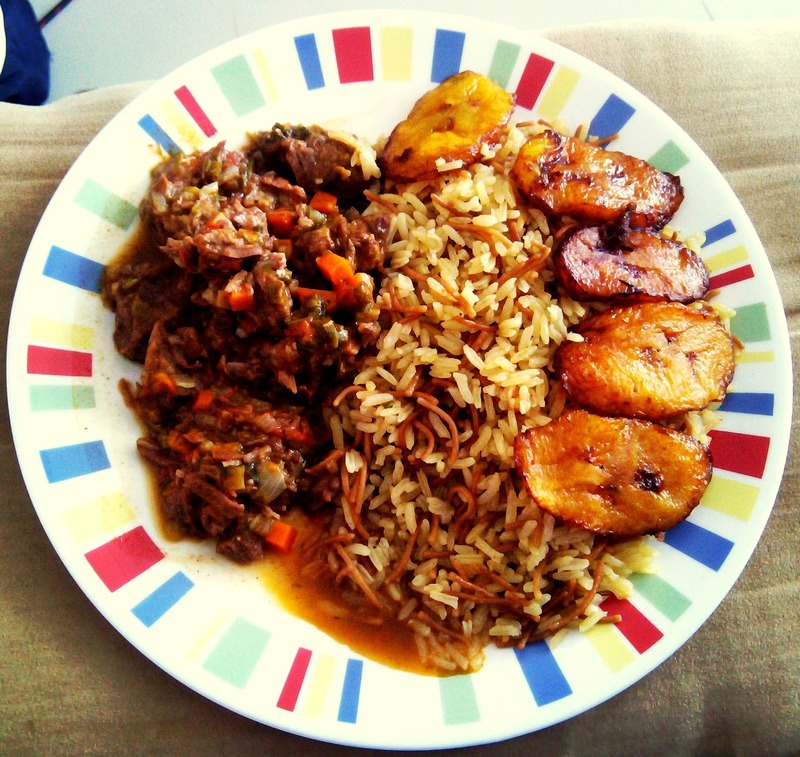 A typical Juanmi made lunch – carne desmechada (slow-cooked shredded beef), rice with noodles and fried plantain. Mmm! Juan Miguel loves to cook. When coming in after a long day, I am almost always greeted with a new and delicious dinner, and living with them has been a great insight into Colombian cuisine. 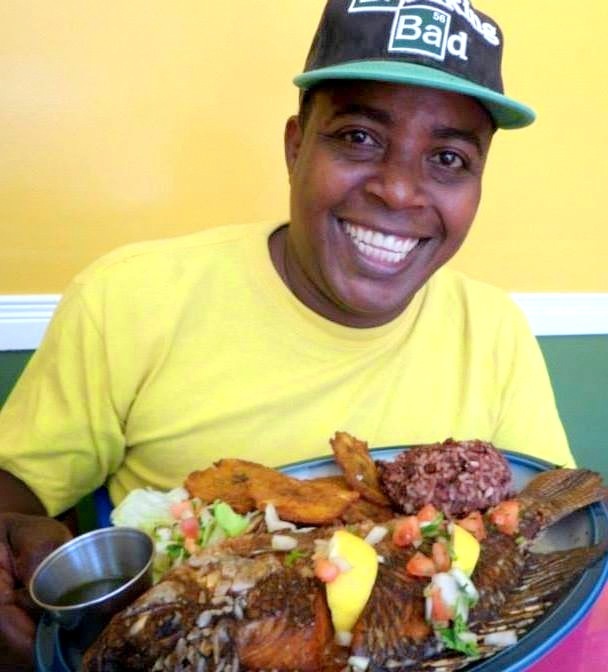 Did you know that the burnt rice at the bottom of the pan (cucayo) is actually a delicacy here? Or that if you cook up pineapple skin with pasta, it makes a delicious thick and creamy drink (chicha)? These are just some of the things Juanmi has taught me, as well as the recipe I’m about to share with you today. 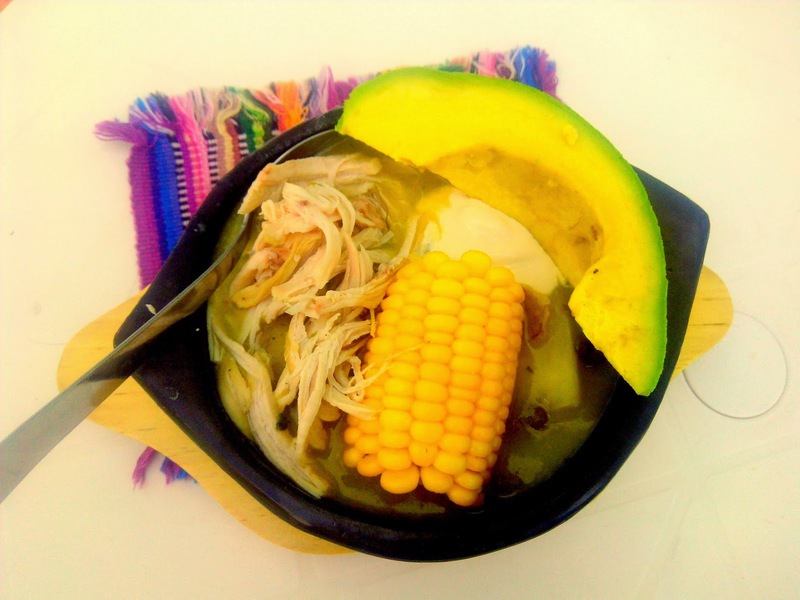 As mentioned in my first post from Barranquilla, ajiaco is a traditional soup originating from the capital, Bogotá. It also turned out to be one of Juanmi’s specialties, which he was more than willing to share with me. A comforting garlic, coriander and chicken broth is thickened by a mix of 3 different potatoes types. Topped with a dash of cream and the very tangy flavors of capers, the final addition of avocado adds to the creamy comfort of this dish. With those cold winter months approaching in the UK, warm yourself up by bringing some Colombian flavor into your home. This should make enough for about 6-8 people, so invite your friends round and get cooking! – 1 onion, finely chopped. – 1 avocado, cut into quarters lengthways (one slice per serving, or more because it’s just delicious). 1) Firstly, get your water on the boil and add the chicken stock, salt and pepper. Then, add in your chopped vegetables, coriander and chicken breasts. Cook this all on a gentle simmer for a little more than half an hour, and when chicken breast is cooked through, remove from stock and keep aside. 2) Strain out all the onion, pepper and coriander, and bring stock back to heat. 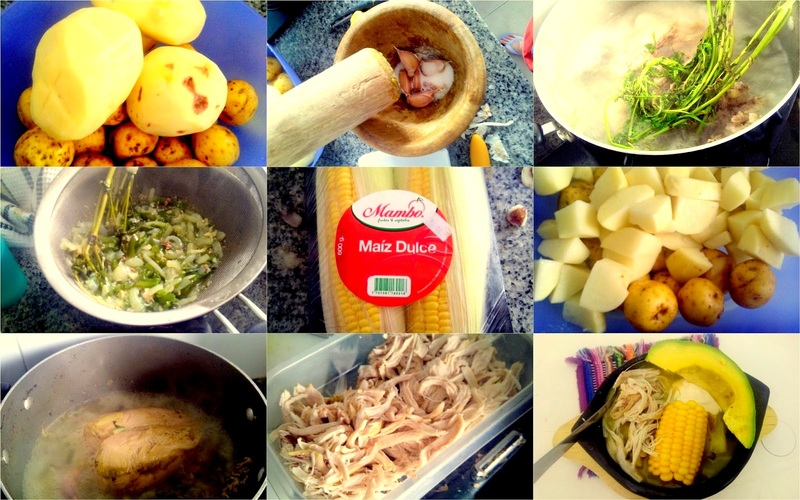 Now add your chopped potatoes, guasca (or bayleaf/parsley substitute) and corn. 3) Shred your chicken with a fork, and return to heat. 4) Your delicious soup is now ready! Serve each portion in a deep bowl, making sure each serving has a portion of corn. Top with some thick heavy cream, and a teaspoon of capers per bowl. Add in a slice of avocado, and more coriander to garnish if you desire. This is actually meant to be served with rice as well, but I found it amazingly filling as it was! Should you feel extra hungersome, by all means serve it up on the side. This soup is like a big warm hug in a bowl. The mixture of flavours works so well and serves a crowd perfectly. Give it a go and let me know how it turns out, and keep on reading to stay up to date with my culinary conquests here in Colombia.